The term “tripod alternative” conjures up a variety of devices used for camera stabilization in place of a tripod. These come in two basic types: those that are self supporting on a more or less level surface and those that attach to supports with some sort of connecting mechanism. Some devices do both. What follows is a general description of the varieties of tripod alternatives available and their uses. Mini-tripods, as the name implies, are small tripods made to be self supporting on horizontal surfaces. A recent variation on the concept is bendable legs made of ball joints or containing flexible wire shafts. These can be wrapped around support objects for attachment. They connect to vertical or horizontal supports. But the support object must be small enough to wrap the mini-pod legs around and grip solidly. If the support is too big the connection is unreliable or impossible. Bean bags or sand bags provide reliable camera support. They have been a DIY alternative for years and commercial versions with camera mounting screws are available. Bean bags will work on any surface as long as it is relatively horizontal. Vertical or steeply angled objects will not work. There is no tripod head so composition is a matter of positioning the camera on bean bag to aim it. Bean bag mounts come in a variety of sizes for different cameras. Some versions can be rather heavy and most are not pocket size. But for use on horizontal surfaces, a bean bag device will do the job. There are a number of tripod alternatives that use some type of clamp to mount to support objects. These will work on horizontal or vertical supports and provide a solid, dependable connection. However the support object must be small enough to accept the clamp. Too large and it won’t work. This limits the objects that can be used as camera mounts. Also, most clamp type mounts are not self supporting on a level surface. Another variation on the minipod concept is the use of Velcro straps to connect to support objects. The straps attach reliably to vertical or horizontal supports as long as the object is small enough to wrap the straps around. 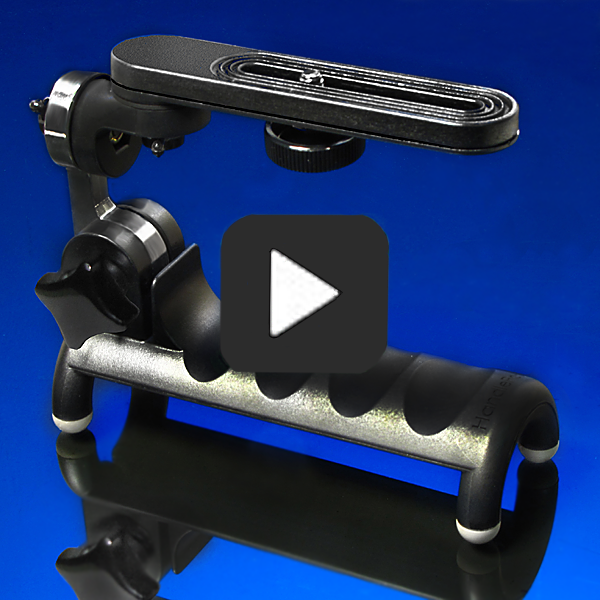 The legs fold out to form a standard mini-tripod that can be used on flat surfaces. Suction cup mounts have been used to attach cameras to a variety of surfaces, either vertical or horizontal. But the surface must be clean and smooth. They work best on metal or glass. The most common use is on the bodies or windows of vehicles for motion video. These are mounts that feature an adhesive backing that will stick to many surfaces provided they are clean and relatively smooth. Some have a peel-and-press adhesive that is more or less permanent and can’t be easily removed or re-positioned. Another type uses flexible adhesive goo. It can be peeled off and reused. The sticky putty will pick up dirt that must be cleaned. Adhesion is not as reliable on rough, unclean objects. The camera mount has limited movement and can’t be rotated from horizontal to vertical. But it will stick reliably on many surfaces though it is a good idea to test adhesion first. That pretty much covers the different types of tripod alternatives and their uses with one exception—Handlepod. This product differs in a number of ways from the typical run of tripod alternative devices. More about this in the next blog. This entry was posted in Camera Stabalization, Low Light Photography, Shake Free Video, Tripod Alternative on March 19, 2015 by main user.